Meet Guinness the dachshund, he has IVDD. Guinness is just a baby and he began having some serious back pain because of the disc disease. 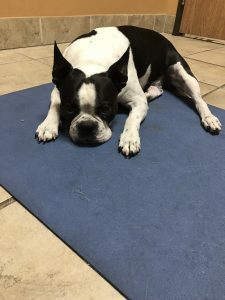 After going to their veterinarian, Guinness was given several options including medication for now and potentially surgery later on, maybe a wheelcart, depending on his own situation. That was certainly a lot of information to take in for such a young and once spunky guy. He was diagnosed with IVDD, a very common condition in the Weiner dog world. Once they got him home from the vet, his fur parents really wanted to look into other options for his care. Guinness came to see us shortly after this bout of pain began. He was crying, shaking, and unwilling to do his normal everyday activities. Even bending his head down to eat was a problem, and he certainly wasn’t jumping up onto the sofa anymore. It all had happened quite quickly and what seemed to be out of nowhere. Guinness walked in all hunched up and was a tight little ball of muscle spasm. We gave his dad a few different exercises to try with him and told him to get back in one week later for another visit to get the ball rolling. Touching base with his dad a few days later, Guinness was already 70 percent back to himself. He wasn’t on any medications, he was walking and eating, and he was back to getting on his bed and the sofa. After visit number two his hunch had completely disappeared and he was walking completely normal. 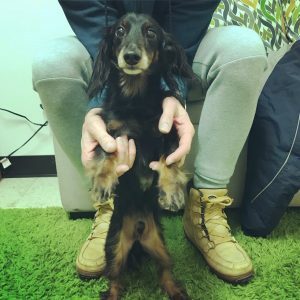 Guinness will always have IVDD, and the risk of him getting hurt is definitely higher, however, because his parents have chosen to supplement his standard care with chiropractic, we are hoping to prevent the majority of what normally comes with the diagnosis. We have no interest in seeing Guinness undergo surgery or end up in a cart, that’s why he has become a well adjusted dog!